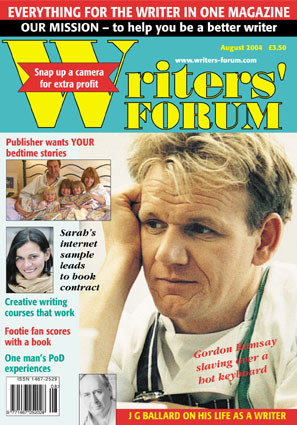 If any visitor to this site would like a free copy of Writers' Forum, Britain's best magazine for writers, please email your request direct to johnjenkins@writersforum.com, mentioning WritersServices.com. We regret this offer is restricted to those with UK addresses only. The monthly column by John Jenkins, editor of Writers' Forum, is now available on the WritersServices site. Don't forget to give a UK postal address in your email requesting a free copy.